Martas, Fox Forx, and King Iso hubs - bad combo? Thread: Martas, Fox Forx, and King Iso hubs - bad combo? Did you get your fresca? I've had no problems with 2 sets of Louise on my Fox forx and King hubs. But, come to think of it, I have the older discos with the adaptors so that might have something to do with it. The Marta v. Louise calipers are pretty similar so I doubt the problem is there. Any chance you could slightly file down the caliper? PS. Are you rotating giant avatars these days? So I pulled the pads to see if the caliper and rotor were running dead center (using the channel in the caliper, not the pads) after I had things rubbing again on the outside. I can get it set up fine, but after riding it, it rubs on the outside pad. i guess I'll try and reanimate that outer piston again. But, any tips would be great. Squeeky - too many people actually thought gutman was me, plus I'm a big fan of terry tate - office linebacker. Push both pads back flush into the caliper. Does the rotor sit roughly midpoint between them? It should. If it is too closer to the outer, then something funky is going on with the fox/king iso/marta combo. If not, then definitely try the reanimation tip. Take out the pads and hold down the opposite (inner) side with plastic tire lever. 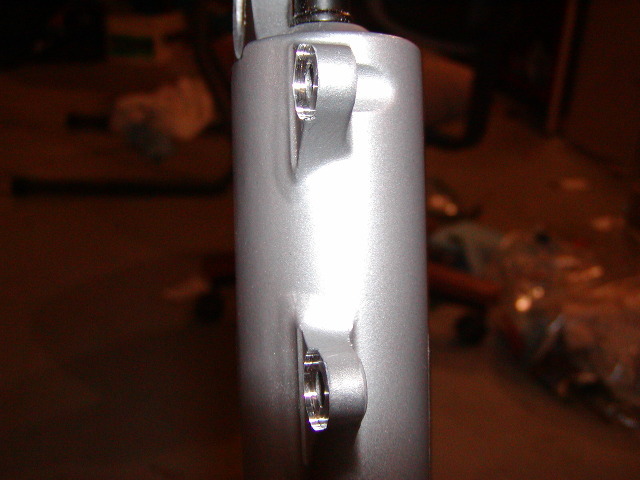 Squeeze the lever a few times to get the outer piston to engorge, then push it back in. Repeat a few times on either side. Be careful not to push it out too far because it can get hydro-locke. I had this happen once & it wasn't fun. I had to open the master & push hard to get it to reset. Fluid went everywhere. Then put the pads back in & put the wheel back in. squeeze the lever to center the pads. Again take a look at which pad is closer. Now you can micro-adjust. Gently push the rotor over the the closer side and squeeze the lever to move the opposite pad. Do this until things look just right. That should do the trick unless it's due to some hardware incompatability which seems unlikely. Only other tip I can give you is that I have noticed the Fox/King combo to be a bit finicky after removing & reinstalling the wheel. Once things are operating A-OK I place a spot on the dropout and on the axle cone and when I reinstall the wheel I make sure these are aligned. I also use a qwick-nut which helps. Next you can use the big guy from Daredevil and the Green Mile. Yup, when the pads are out and the skewer is closed - dead center. I use a 1up skewer nut so it's the same tightness every time, and I have the hub and fork marked to make sure it's in the same spot. It's actually a bit closer to the inside when things are set up, but after applying the brakes for a while, the outer rubs just a bit. I'm micro adjusting. These brakes are powerful for their weight, no doubt. But a pain to set-up this front combo. Really wish I hadn't had to machine as much. Why don't you try placing a 1mm-2mm spacer on the left end of the axle as it will kick the forks that much further out from the rotor and should fix your problem. Using a spacer obviates the need to machine the fork tabs. 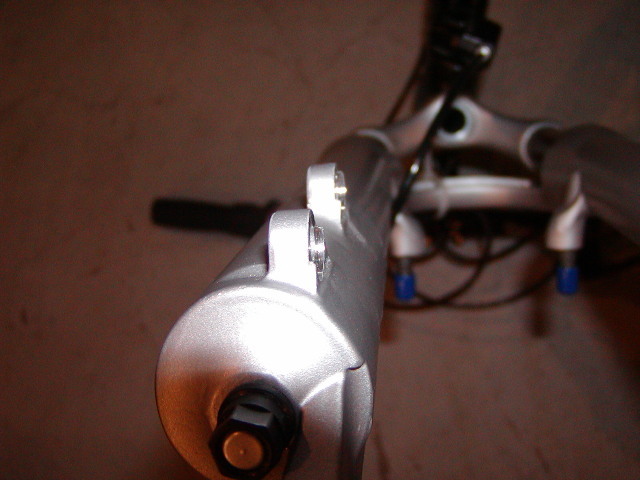 It is best to place the spacer inboard of the final nut to keep its rough surface to mate with the fork tabs. The initial setu-up is a bit time consuming, but it's hassle free once dialed in. I wouldn't trade my discs for anything. Olak, did you measure how much you machined? I'm between 1.5 and 2mm now, and really don't want to pull off more. Seems a bit extreme to get some brakes to work. Though, I've heard of the same problems with the Hopes. I've gotta admit, nothing beats Avid's disc mounting system, it's heavy, but damn easy. My hayes were a pain to bleed, but the G2 rotors were easier than this to set-up. Can you machine the caliper bracket? Instead of machining more off the fork tabs, can you make up the difference on the caliper mounting bracket? Fox fork (Float & Vanilla), Iso disc hubs, and 03 Sls, 04 Martas.....Coker installed the SLs on a my Hammerhead and a local mechanic (Brian) installed the Martas on my Quasi. Brian was worried about the amount of material he had to remove from my Vanilla tabs to center the rotor in the Magura caliper.....but I've had no problems with the front brake in three months of hard riding. BTW....I love the Maguras! Will never run V-brakes again. I haven't machined them yet - I have ordered a facing tool, but I can tell looking that I am in the same area of measurement as you - 1-2mm. I am assuming that there is a dimensional problem with the King iso hubs? Has anyone contacted King to check on this? I have heard of this issue with about every imaginable combination of fork and brake. All I can offer to do for you is to have you send in your hub and we will measure it in our machine shop to make sure it it within the ISO tolerance specifications of .401" +- .010". Since we have been manufacturing the ISO hub I have never had one come back that was out of spec. You are still welcome to send it back though. Please let me know if you would like to send it back and I will assign you an RA#. A good thing to keep in mind is that machining is a more accurate manufacturing process than casting of forging. Thanks for your patience. We have recently relocated to Portland and are still getting settled in. Well, I've talked to everyone on this one and more than a few shops. The general concensus is that the combo just results in this. King's hubs are within specs, fox's legs are seemingly within Iso spec as are the brakes. Just the combo. But everyone I've talked to has said this combo results in a minimum of .5 mm being taken off the lowers, with up to 2mm off. I'm at right around 1 and think I can get it to work. Right now things are apart, I'll report back again later this week when I build the bike back up. ...ordered a bike with the same spec. All said this combo is not singled out as unusual, or a bad fit. Universal sets up many bikes with this spec, saying it's uncommon to have to remove even as much as 1/2mm, usually just enough to account for paint differences on the dropouts. Hope it works out OK for you GG, and I know you're a fellow HH owner. Just what I didn't want to hear. I've got a Fox F80X already (still in box waiting for trails to dry out) and am waiting for my new King ISO set. FWIW, I'll be using either Formula B4 SL+ or Hope Mono Mini with this set-up. For the last 6-yrs, I've been using numerous forks (lots of Bombers, WB SC72UL, 3-4 SIDs, a Morati Ti rigid, etc.) with various brakes (Hope C2, Hope Minis, Formula B4, Formula B4 SLs and Shimano XTR/XT). The only constant was a Hope Bulb front disc hub. I never encountered any problems mounting any brakes to any fork. I really, really, really hope I do not have any issues with my new set-up....(fingers crossed). sounds like various reports out there, but that in general it's 1/2-1mm that needs to be removed. I talked to Magura, and they did say they here more reports on this combo than anything else. I measured last night, I had to take off exactly 1mm, which looks like more than it is. Seems as though things should work. Speedgoat also told me they have had to machine a bit off with this combo. My bet it comes down to production runs of the various parts, and skewer tightness. I'm not worried, I wrenched in a shop for several years, but I was just looking for others experiences.